Ahead of yesterday's summit in Downing Street on how to tackle "industrial scale" child abuse in the UK, the Prime Minister met these five women. 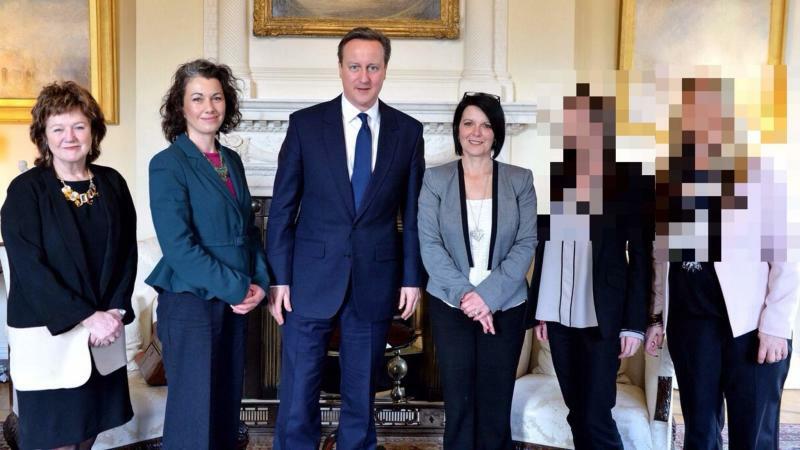 Without those photographed here with the PM, the scale of sexual abuse in Rotherham might still be going undetected. There are two obscured faces. One is of abuse survivor Isobel (second right) – who as a young girl was groomed and sexually abused by gang members in Rotherham. Isobel had the courage to speak about her ordeal as did the mother of a separate victim, (far right) who witnessed her daughter being sexually exploited. Their experiences reflected those of hundreds of children in Rotherham who were disbelieved or ignored by police and social workers. "For years they were dismissed and belittled," says MP Sarah Champion (second left). "The mother was blackmailed by authorities to keep her head down. Now to have the Prime Minister invite them to Downing Street, it's such vindication for them." As he arrived at the summit the Prime Minister said: "I've just spent half an hour with some of the survivors of abuse in Rotherham and these are stories that are going to stay with me forever. They are absolutely horrific, what has happened. "I think it's very important we take a step back and just recognise the horrific nature of what has happened in our country. Young girls - and they are young girls - being abused over and over again on an industrial scale, being raped, being passed from one bunch of perpetrators to another bunch of perpetrators. "And all the while this has happened with too many organisations and too many people walking on by." One person who didn't walk by was Jayne Senior (third right) who, with her organisation Risky Business, tried to highlight the cases of hundreds of girls who were being groomed by Asian gangs in Rotherham. The council saw her as a nuisance and shut the organisation down. It wasn't until Professor Alexis Jay (far left) released an uncompromising report last year , that the outreach work by Risky Business was recognised as vital for identifying victims of a widespread problem in the town. Prof Jay identified 1,400 victims of child abuse in Rotherham and that a blind eye was being turned by authorities, in part due to a fear of being labelled "politically incorrect". But even after Prof Jay's report, many on the council refused to accept the reality of what was happening. Ms Champion picked up the campaign and set out a five-point plan which would become the foundation for Tuesday's summit. Firstly, she called for a national task force – which is now backed by the Government. She describes this as an expert swat team of police, social workers and psychologists who would be parachuted in where problems such as Rotherham emerge. Secondly, Ms Champion believes that there should be sexual and relationship education at key stage 1 in schools so that children understand what a normal healthy relationship is. Ms Champion tells of meeting a victim. She said: "She was gang raped, tortured, beaten up and abused, and she turned to the internet for guidance and found images of women being beaten up, tortured and abused – so she thought it was normal." The third point is to ensure all professionals working with children have mandatory training in how to spot sexual abuse. During the summit it was suggested that the current model taught to social workers was developed in the 1990s and needed a rethink to incorporate the development of technology and a recognition that abuse doesn't just take place in the home, but can be organised crime. Chief Social Worker Isabelle Trowler, who was present at the summit, wrote to directors of children's services asking them to review their processes and "assure yourself that any tools are not only fit for purpose, but being properly implemented as well. In her report, Alexis Jay raised particular concerns about a tool used in Rotherham and South Yorkshire which was based on a numeric scoring system that resulted in risks being underestimated." The Government has now backed Ms Champion's fourth suggestion for a national awareness campaign about child exploitation and the summit also discussed her fifth and final point that there needed to be a culture where child victims are believed and properly supported by the police and prosecution services. Credit should be given to the senior civil servant Louise Casey, whose report last month dubbed Rotherham council "not fit for purpose". The campaign for change has gathered pace since then. Ms Champion describes the progress as moving from "warm words to strong words, but now we need to take action". As for the Prime Minister meeting the women at the centre of the scandal and hearing their stories Ms Champion said: "Before then he understood the situation intellectually, now he understands it emotionally. He got it as a human and as a parent."